Download "State University of New York Farmingdale State College Department of Aviation. 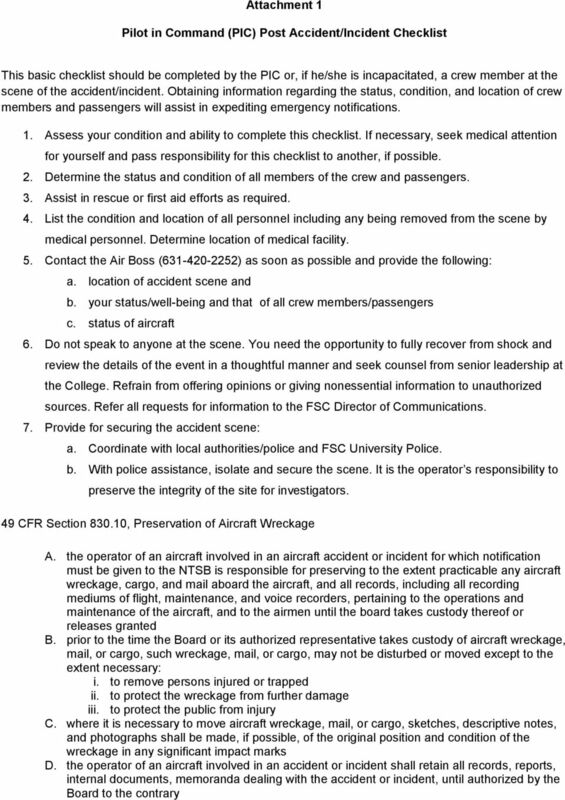 FSC Aviation Accident Response Plan"
2 SECTION A PROCEDURES TO BE FOLLOWED IN THE EVENT OF AN OVERDUE AIRCRAFT 1 The Farmingdale State College Air Boss is responsible to track all flights of Farmingdale State College aircraft using specified forms. The Air Boss will confer with the Pilot in Command (PIC) prior to PIC departure from the Flight Center and will establish an Estimated Time of Arrival (ETA) at the destination airport which can be either our home base at Republic Airport (KFRG) or at another airport for cross-country flights. 2 For flights landing at an airport other than Republic, the pilot must file a flight plan with the FAA (Flight Service Station) and provide a copy to the Air-Boss. The FAA will institute procedures for overdue or lost aircraft if the pilot does not close his or her flight plan. Normally this includes calling the Farmingdale State College Air-Boss (Telephone # ). 3 If no contact is established between the PIC and the Air Boss by the ETA, then the Air Boss should initiate the following: a. Attempt radio contact via "STATE OPS" frequency MHz b. Attempt radio contact through any other FSC aircraft that may be airborne on frequency MHz c. Attempt telephone/text message/ contact with PIC/student/passenger d. Check flight tracker using tail number at 4 If no contact after ETA + 15 min. then the Air Boss should: a. 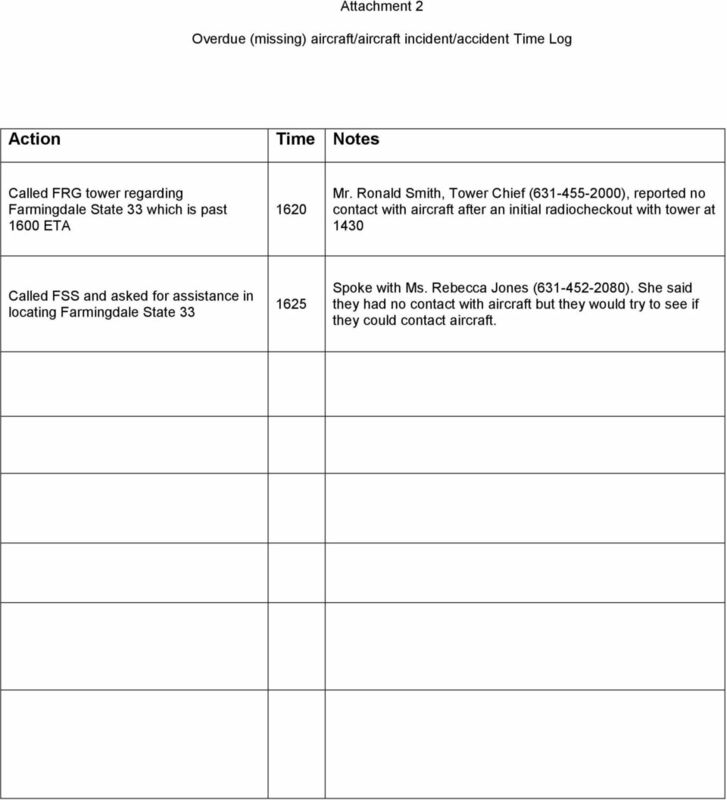 Start a written timeline of actions to include action taken, time when taken, person(s) with who contact was made, a callback phone number for those person(s), and any other information you would like to record. A sample timeline is included as attachment 2. b. Call Republic Tower or destination air traffic control tower to inquire about aircraft c. Call destination Fixed Base Operator ( FBO) to inquire about aircraft d. Call FAA Flight Service Station to determine if flight plan was activated, time of activation, last known position. Ask about any other data they may have on the flight. 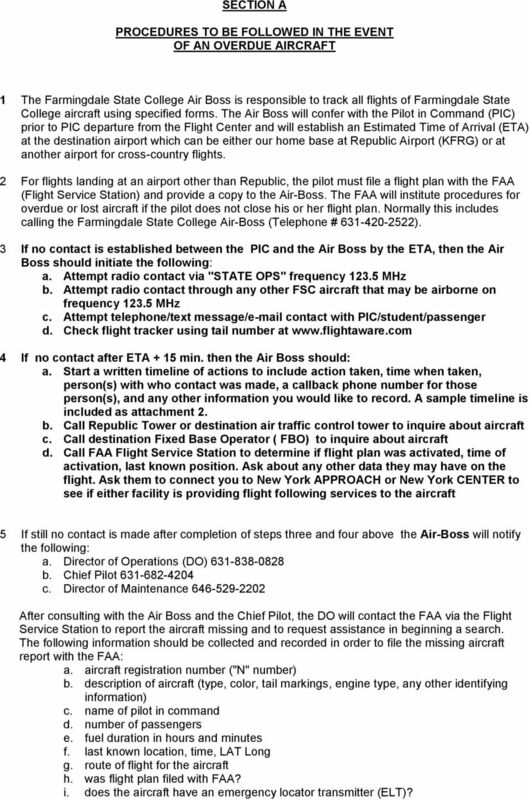 Ask them to connect you to New York APPROACH or New York CENTER to see if either facility is providing flight following services to the aircraft 5 If still no contact is made after completion of steps three and four above the Air-Boss will notify the following: a. Director of Operations (DO) b. Chief Pilot c. Director of Maintenance After consulting with the Air Boss and the Chief Pilot, the DO will contact the FAA via the Flight Service Station to report the aircraft missing and to request assistance in beginning a search. 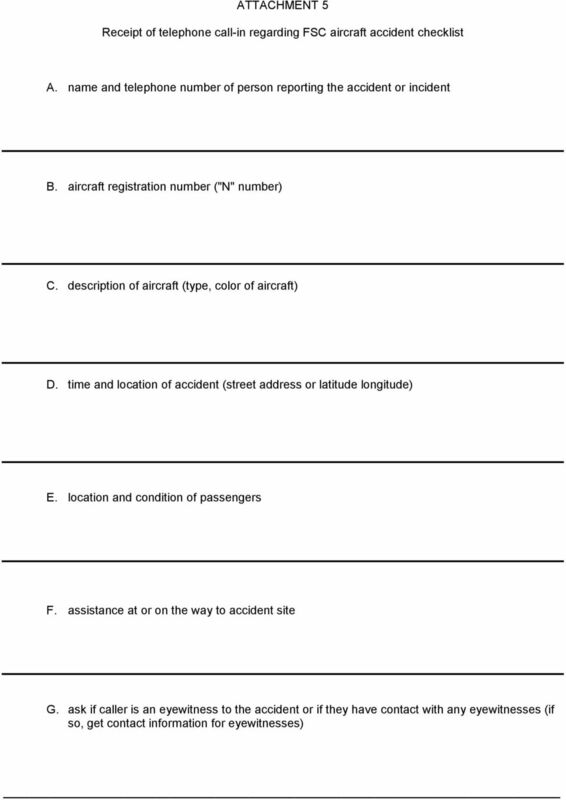 The following information should be collected and recorded in order to file the missing aircraft report with the FAA: a. aircraft registration number ("N" number) b. description of aircraft (type, color, tail markings, engine type, any other identifying information) c. name of pilot in command d. number of passengers e. fuel duration in hours and minutes f. last known location, time, LAT Long g. route of flight for the aircraft h. was flight plan filed with FAA? i. does the aircraft have an emergency locator transmitter (ELT)? 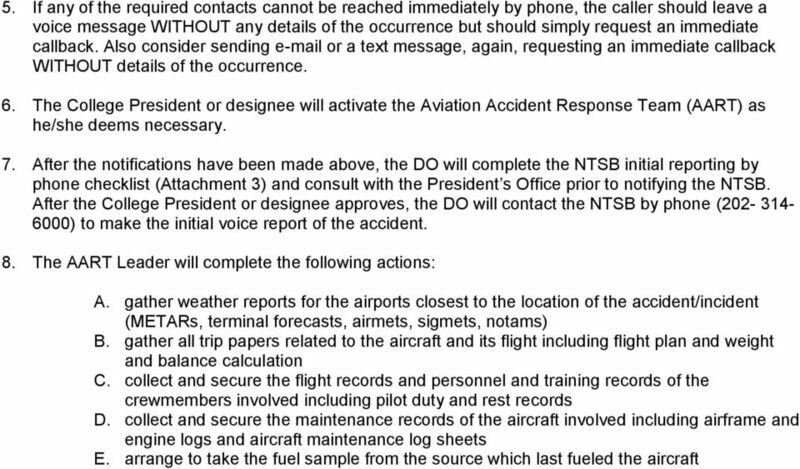 3 The DO will also contact the President of the College or his/her designee to advise of the missing aircraft and to determine if the Aviation Accident Response Team should be alerted. 6 ONLY THE COLLEGE PRESIDENT OR HIS/HER DESIGNEE IS AUTHORIZED TO SPEAK ON BEHALF OF THE COLLEGE IF THERE ARE INQUIRIES REGARDING THE MISSING AIRCRAFT. This includes inquiries from (but not limited to): police, media, NTSB, FAA. All inquiries should be directed to the President's office or designee. 6 Section C Survivor and Family Assistance Responsibilities Notification of next of kin. Following an aviation accident involving injuries and/or fatalities, notification of the victims families is an immediate priority. 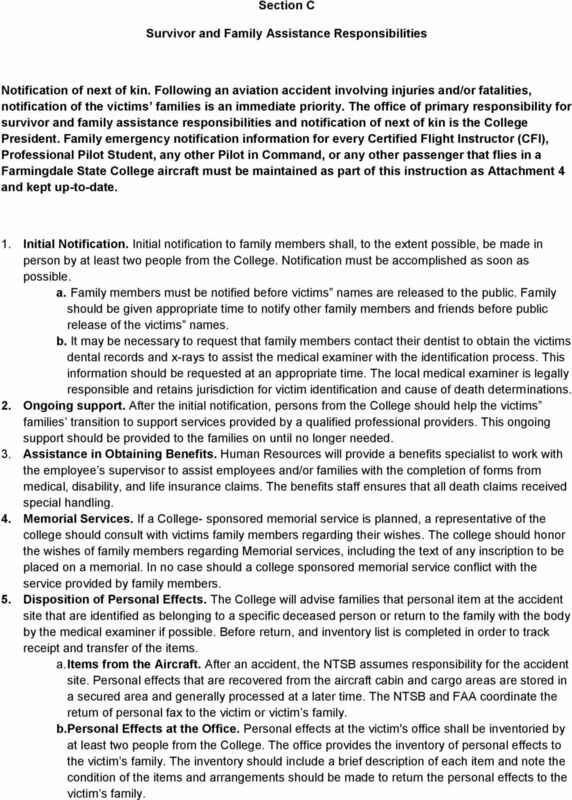 The office of primary responsibility for survivor and family assistance responsibilities and notification of next of kin is the College President. 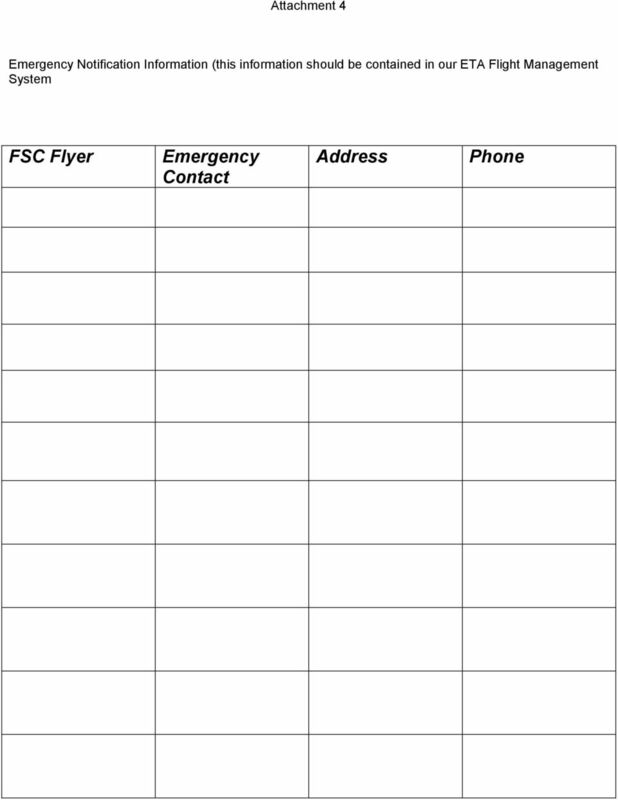 Family emergency notification information for every Certified Flight Instructor (CFI), Professional Pilot Student, any other Pilot in Command, or any other passenger that flies in a Farmingdale State College aircraft must be maintained as part of this instruction as Attachment 4 and kept up-to-date. 1. Initial Notification. Initial notification to family members shall, to the extent possible, be made in person by at least two people from the College. Notification must be accomplished as soon as possible. a. Family members must be notified before victims names are released to the public. Family should be given appropriate time to notify other family members and friends before public release of the victims names. b. It may be necessary to request that family members contact their dentist to obtain the victims dental records and x-rays to assist the medical examiner with the identification process. This information should be requested at an appropriate time. The local medical examiner is legally responsible and retains jurisdiction for victim identification and cause of death determinations. 2. Ongoing support. After the initial notification, persons from the College should help the victims families transition to support services provided by a qualified professional providers. This ongoing support should be provided to the families on until no longer needed. 3. Assistance in Obtaining Benefits. Human Resources will provide a benefits specialist to work with the employee s supervisor to assist employees and/or families with the completion of forms from medical, disability, and life insurance claims. The benefits staff ensures that all death claims received special handling. 4. Memorial Services. If a College- sponsored memorial service is planned, a representative of the college should consult with victims family members regarding their wishes. The college should honor the wishes of family members regarding Memorial services, including the text of any inscription to be placed on a memorial. In no case should a college sponsored memorial service conflict with the service provided by family members. 5. Disposition of Personal Effects. The College will advise families that personal item at the accident site that are identified as belonging to a specific deceased person or return to the family with the body by the medical examiner if possible. Before return, and inventory list is completed in order to track receipt and transfer of the items. a. Items from the Aircraft. 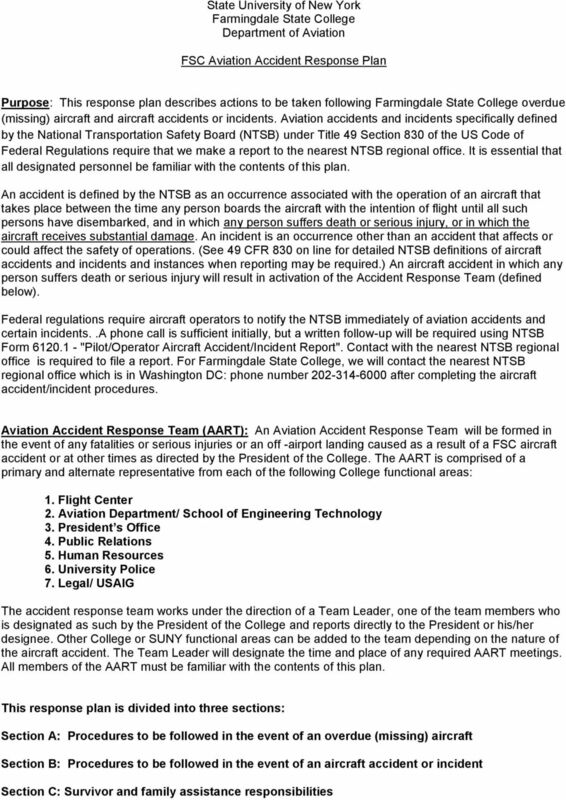 After an accident, the NTSB assumes responsibility for the accident site. Personal effects that are recovered from the aircraft cabin and cargo areas are stored in a secured area and generally processed at a later time. The NTSB and FAA coordinate the return of personal fax to the victim or victim s family. b. Personal Effects at the Office. Personal effects at the victim's office shall be inventoried by at least two people from the College. The office provides the inventory of personal effects to the victim s family. The inventory should include a brief description of each item and note the condition of the items and arrangements should be made to return the personal effects to the victim s family. 8 Attachment 2 Overdue (missing) aircraft/aircraft incident/accident Time Log Action Time Notes Called FRG tower regarding Farmingdale State 33 which is past 1600 ETA 1620 Mr. Ronald Smith, Tower Chief ( ), reported no contact with aircraft after an initial radiocheckout with tower at 1430 Called FSS and asked for assistance in locating Farmingdale State Spoke with Ms. Rebecca Jones ( ). She said they had no contact with aircraft but they would try to see if they could contact aircraft. 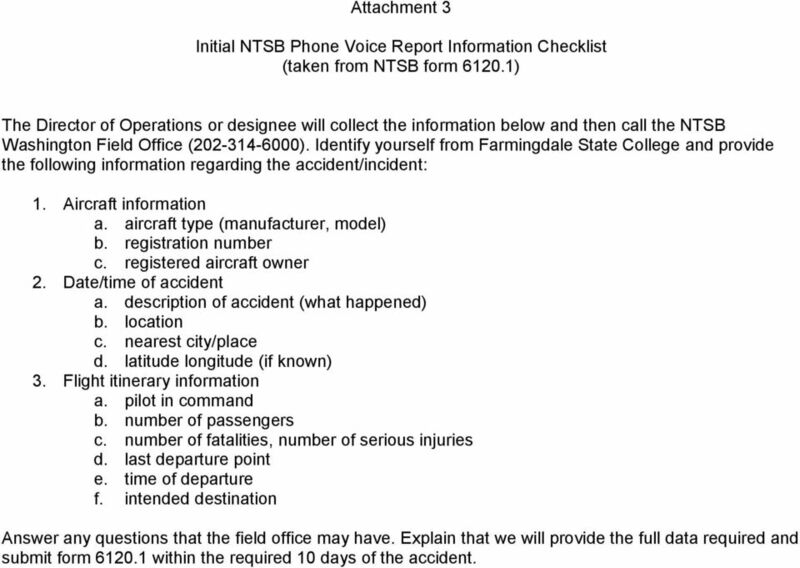 9 Attachment 3 Initial NTSB Phone Voice Report Information Checklist (taken from NTSB form ) The Director of Operations or designee will collect the information below and then call the NTSB Washington Field Office ( ). 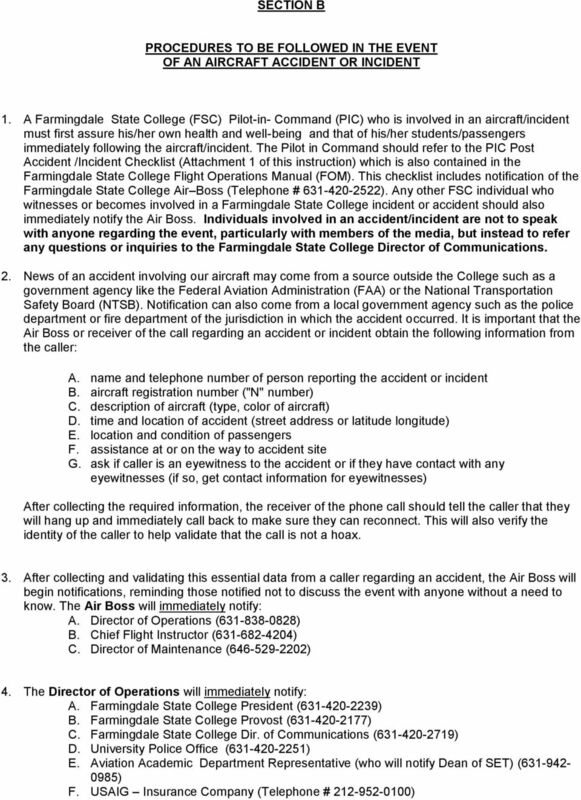 Identify yourself from Farmingdale State College and provide the following information regarding the accident/incident: 1. Aircraft information a. aircraft type (manufacturer, model) b. registration number c. registered aircraft owner 2. Date/time of accident a. description of accident (what happened) b. location c. nearest city/place d. latitude longitude (if known) 3. Flight itinerary information a. pilot in command b. number of passengers c. number of fatalities, number of serious injuries d. last departure point e. time of departure f. intended destination Answer any questions that the field office may have. Explain that we will provide the full data required and submit form within the required 10 days of the accident. Maryland State Firemen s Association Executive Committee Meeting December 5, 2009 Maryland State Police Aviation Command Update Presented by: Major Andrew J. (A. J.) McAndrew Hello, my name is Major A. Chapter 1 2 15 Air Medical Transport Planning Good planning can save lives. Planning for air medical transport is important to maximize efficiency and safety; it helps create the best care for patients. Crisis Communications Plan Cleveland Metropolitan School District External Affairs Department January 13, 2009 1 Table of Contents 1. Purpose 1.1 Why do we need this plan? 5 1.2 What are the objectives? CHESTER COUNTY EMS COUNCIL, INC. Policies and Procedures Air Ambulance Utilization. Air Ambulance Utilization for Patients in Chester County. The Town of Fort Frances CRITICAL INJURY REPORTING AND INVESTIGATION SECTION HEALTH AND SAFETY NEW: August 2004 REVISED: November 2007 POLICY Resolution No. 406 (consent) 11/07 Supercedes Resolution No. MS 264 Procedures. The PCMO must inform the Country Director (CD) of a planned medevac. *fl._ -" POLICYÆROCEDURE/PROTOCOL Page:lof 6 Date:0710112004. I. Authority: Health and Safety Code, Sections 1797.204,1797.206, and 1797.218. EMERGENCY RESPONSE PLAN A template for Air Carriers PUBLIC HEALTH EMERGENCY 1 1. Introduction IATA recommends that all air carriers have emergency response plans to deal with public health emergencies.